The Firework display this year will be the best ever! For the first time there will be a Laser display with the fireworks. There will be lots of foodstalls including a BBQ and the popular Mozzarella Nation Pizza, as well as Coffee stop and a candy floss stall. Of course the bar will be open too. 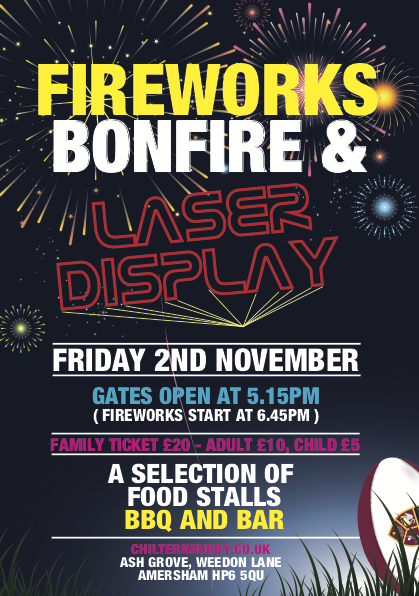 A coconut shy and 'hook a duck' will also be there to provide entertainment and glow sticks will be on sale. Gates open at 5.15pm, for Fireworks to start at 6.45pm. £10 Adult, £5 Child, £20 Family. We hope that many club members, family and friends will be able to join us for this fantastic event!